Silky has gathered almost 100 years of experience in the production of handsaws, always with the greatest devotion and according to the latest techniques. 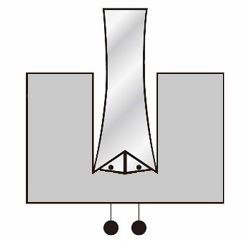 The special alloys used, the metalworking knowledge and the technical aspects of the different type of teeth configurations stand for a unique quality. On this page these aspects are described extensively. By the pictograms these can be recognized and found on this website. Silky saws with 4-RETSUME teeth belong to the category of fastest handsaws on the market and are very well suited for the toughest jobs. The teeth are grinded in such a way so that every 4 teeth in a row form one combination. This does not only leave a very smooth tree wound but also enables a perfect discharge of saw dust. The chrome plating on the saw blade makes the surface of the blade extremely hard and longwearing, while reducing frictions and increasing the lifetime of the blade. Furthermore, the chrome plating protects the blade from rusting and resin. Before applying the chrome plating, Silky polishes the blade as smooth as silk. This makes that the blade encounters even less resistance in the wood while sawing. The tips of the teeth are heated up to a very high temperature for a split second. As only the tip (or in other words the cutting part) of the tooth is heated, the rest of the tooth keeps its cutting quality but also its flexibility. Induction hardened teeth have a lifespan of three times that of non-treated teeth. They cannot be sharpened and are recognizable by the black teeth tips. When the teeth are not induction hardened, they can be filed with the special Silky file. Click here for an overview of all saws that can be filed and for instructions on how to file a Silky saw. A number of Silky saws (Tsurugi – Table Noco – Temagari) and axes / machetes (Nata – Ono – Yoki) are equipped with the unique Genki grip. This grip consists of two parts that can be zipped off the blade and placed on a new one without the use of tools. The rubber Genki grip absorbs the sawing vibrations to a maximum as no screws or bolts are attached that could guide the vibrations. The Genki grip offers a superior grip, even in wet conditions or while wearing gloves. The iF DESIGN AWARD is among the most prestigious and largest design competitions in the world. Since 1953, designers, manufacturers and users have looked to iF as a sign of good design. An iF DESIGN AWARD is a seal of excellence, a testimony of quality, and a challenge to the competition. For users, it is a symbol of trust. The limited lifetime warranty covers errors in material and construction. This does not include damage caused by transportation, misuse, abuse, and/or normal wear and tear on wearing parts. The product must be handed into the nearest sales or service to undergo a warranty evaluation. Shipping and Handling costs are not covered by the warranty. A product that qualifies for warranty assessment will be repaired first, if possible. This warranty applies only for NON-COMMERCIAL USE ONLY. "MIRAI-ME” – Silky’s patented teeth! The razor sharp teeth are ground in the blade with precision, each with 4 cutting edges and an extremely smooth surface as a result. For an optimal discharge of saw dust, one of every so many teeth (depending on the saw model) has been ground to the outside. This unmatched patented MIRAI-ME technology makes it possible to use the saw for 3 types of sawing: crosscutting (perpendicular to the grain), rip-cutting (parallel to the direction of the grain) and diagonally. 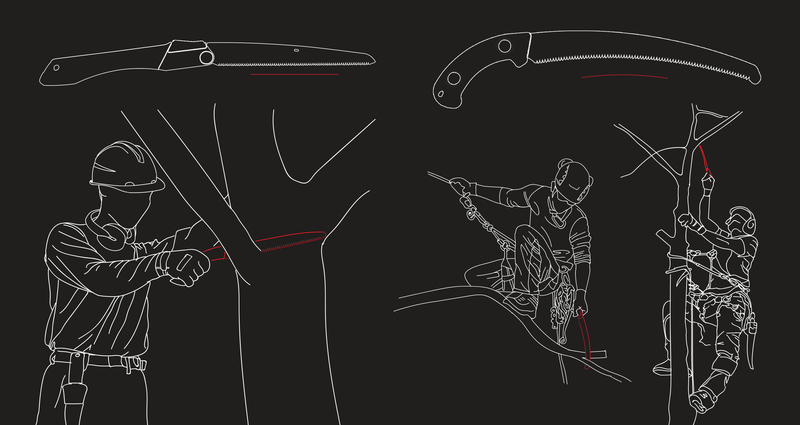 During pruning activities the smooth saw cut will allow the tree wound to be overgrown easily. Within carpentry, the smooth saw cut gives a fine finish, so that sanding is hardly necessary. The advantage of nickel is that this material pours well into the edges. 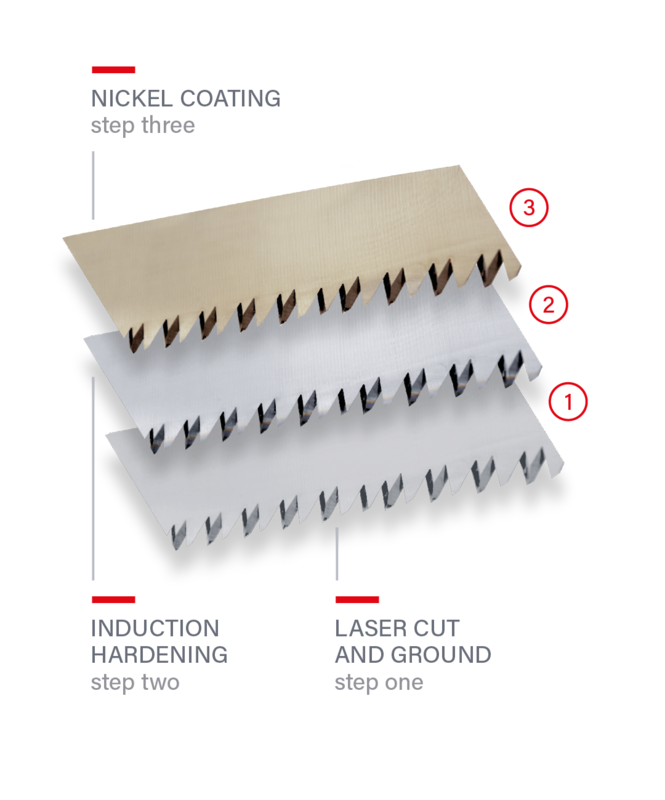 Therefore, the nickel coating is equal all over the blade and that ensures a smooth surface and less material wastage. The nickel plating is applied after the teeth are ground into the blade. In doing so, the teeth will remain sharp for a long time and are protected against rust. Very clean saw cut: without breaking or tearing of the wood, it hardly splinters and creates a very fine, smooth saw cut. The GOM rubber handle absorbs sawing vibrations and offers a superior grip, even in wet conditions or while wearing gloves. Moreover, this handle always feels comfortably warm, even in extremely cold temperatures. Silky uses different types of handles, straight – revolver grip and an intermediate. The handle is of influence on the angle between your saw and wrist, and therewith on how the teeth grab the wood. How bigger the angle between the saw blade and the handle, the better the saw is suited for sawing above shoulder height. Straight handle: with a straight handle you can steer the wood deduction by the place on where you hold the handle. By holding the handle close to the blade, less tension is placed on the blade and this allows you to saw with great precision and control. The wood loss will be minimal. If you hold the handle further from the blade, there will be more tension on the blade. The saw can be fully utilized but with less precision. Revolver grip: this handle offers a perfect angle between saw and wrist while sawing. Sawing requires less effort and less vibrations are created. Because the grip is in line with the wrist, the carpal tunnel is not pinched off. Intermediate: the intermediate combines both styles. You are still capable of steering the wood deduction and the handle allows for an ergonomic angle between saw and wrist. In case the saw has difficulty grabbing the wood, you could place the saw at a 10 degree angle to make sawing easier. Silky uses different kind of teeth configurations – from extra fine to extra-large. The teeth configuration of the saw is mentioned on the blade, next to the length of the saw. Large and extra-large: 4 to 8 teeth per 30 mm. Saws with large teeth saw faster and with more aggression. The large configuration is developed for fast growing, fresh wood with a lot of moisture in the wood cells. The extra-large configuration is especially ideal for the tougher jobs, such as cutting down trees or sawing thick tree trunks. When sawing in dry wood with (extra) large teeth, the teeth will have difficulties grabbing the wood and will cause heavy vibrations. The medium teeth configuration is a real all-rounder. 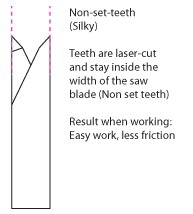 Sawing with teeth configuration 10 is suited for both dead and fresh wood. The fine teeth configuration is specially developed for dry wood or wood with less moisture in the wood cells, such as apple and oak. Extra fine teeth, such as 26 or 32, are specially designed for woodworkers as furniture makers or instrument builders. When sawing with (extra) fine teeth in fresh wood, the teeth will be filled very quickly. The blades with different teeth configurations within a certain saw series (such as the Pocketboy) are interchangeable within the same blade length. Silky has saw blades available with a length of 13 cm up to 65 cm. The preferred blade length is dependent on the diameter of the wood. As a rule thumb can be followed that the blade should at least be 2 x bigger than the diameter of the to be sawn material. If you are for instance planning to saw a branch of 8 cm, you will need a saw blade of at least 16 cm. The straight blade gives a very clean saw cut with more precision than a curved blade. Straight blades are ideal for detailed (formative) pruning activities. Bushcrafters use straight blades to make precision cuts while building shelters, traps and tools. The curved blade saws faster and with more aggression than the straight blade. While working above shoulder height and below the knees, you can still saw on top of the branch without any extra effort, while your arm, wrist and hand remain in their natural position. Furthermore, you can easily feel when the end of the saw cut is reached. This makes your work more efficient, even in the most difficult circumstances. Almost all Silky folding saws can be used in two lock settings. By pressing your thumb on the spring-loaded blade lock, the saw can be unfolded and folded, and, when unfolded, makes it possible to choose between two available blade positions. While unfolding can the saw be secured in the most ideal position for every situation because of two notches in the blade. The first notch is meant for the most ergonomic sawing position. The second notch offers the possibility to saw on a flat surface while keeping your knuckles away and allows to utilize the full length of the blade to the handle. The locking mechanism is very solid and provides a secure locking for when the saw is used. There is no play, which is critical to delivering all of your energy into the blade. 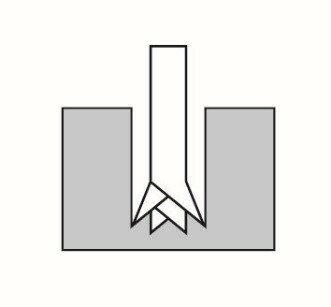 With double-edged woodworking saws all types of cuts can be made, such as for instance the dovetail, without having to change the saw type. The one teeth configuration is namely designed for crosscutting, whereas the other configuration is meant for rip-cutting.